“NSUF” Marksmanship Badge - Bronze, Silver, Gold. 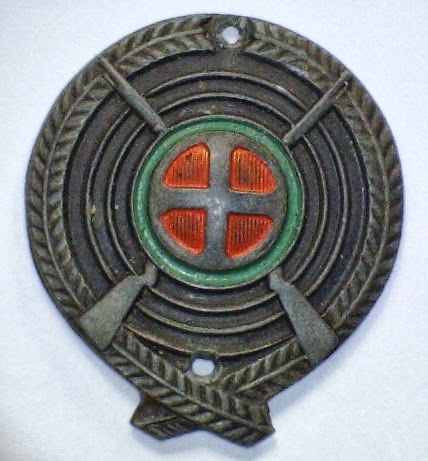 “NSUF” Marksmanship Badge - Bronze - Obverse. “NSUF” Marksmanship Badge - Bronze - Reverse. The badge comprises of a slightly convex circular disk which has a 26 mm diameter. The outer edge is formed by a continuous two leaved wreath which is open at the top and crosses over at the base. Inside is three ringed target with a central Bulls eye that takes the form of the Nasjonal Samlings Ungdomsfylking membership badge. This is a green outer edge with at its centre the ‘Sun Eagle’ symbol of the Nasjonal Samling which is also finished in bronze on the bronze, silver on the silver and gold on the gold. Two crossed rifles complete the design. 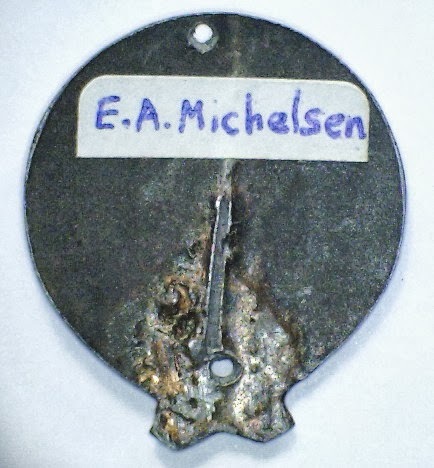 The reverse is plain with a pin hinge and hook.